Italian Villa for Sale in the high end Villa Real. This beautiful home is situated in the very exclusive and secure gated community Villa Real which offers 24 hours security, pool areas and tennis courts, with amazing mountain views during the day and shimmering city lights at night. This Italian style designed Villa features a formal living room with a fireplace, a family room, a large office, half a bath and a spacious kitchen with solid wood cabinets wrap around the space and covered granite countertops, including all the kitchen appliances. A heated infinity pool can be seen from the very large and lovely finished terrace as well as the living and family rooms. Also featuring a complete maid’s quarter with laundry room connected to the large garage on the first floor. There are 4 bedrooms on the second floor, 2 bathrooms, there is a full suite with a terrace and the master bedroom has amazing mountain and city views, this room features a large walk-in closet and a luxury bath with Jacuzzi. This beautiful house counts with Internet and cable TV. 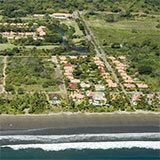 Don’t miss this opportunity; give our Costa Rica real estate office a call today!